The Guides view enables you to manage drawing guides for a given storyboard panel. Use Drawing Guides to assist you in creating a drawing with perspective. Guides can be added, selected, renamed, deleted, cut, copied, pasted and reordered. Guides can also be exported to a file and re-imported later. NOTEFor a description on how to use Drawing Guides, refer to About Drawing Guides. Enable Guide Enables or disables drawing guides. The Brush, Pencil, Line and (optionally) Eraser tools are constrained by the Drawing Guide to draw/erase straight lines only. The drawing tools are not constrained by the Drawing Guide, allowing you to do freehand strokes. The guide acts as a visual aid only. Lock Guide Locks the editing of a Drawing Guide to prevent its accidental modification while drawing. Enable Guide with Eraser Toggles the use of Drawing Guides with the Eraser tool. Drawing Guide axes extend to the edge of the drawing area. Drawing Guide axes are short. Drawing Guide axes disappear while drawing a stroke. 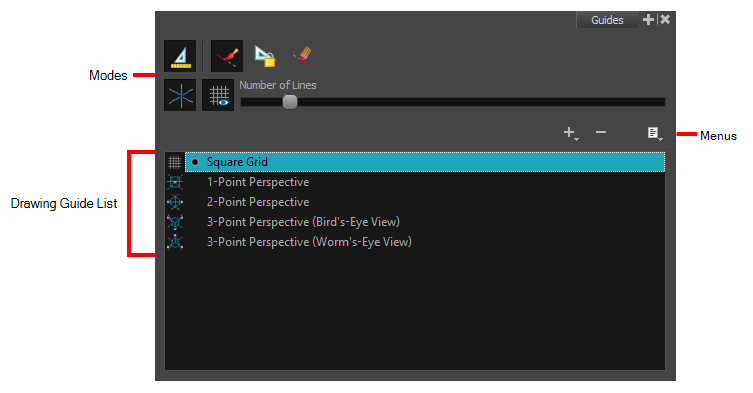 Show Reference Lines Toggles the display of a visual reference consisting of lines that converge towards the vanishing point(s). Adjusts the amount of reference lines to display. Delete Guide Deletes the selected Drawing Guide(s) from the scene's guides list. Renames the selected Drawing Guide. Cuts the selected Drawing Guide(s) from the list and adds it to the clipboard. Copies the selected Drawing Guide(s) to the clipboard. Pastes Drawing Guide(s) from the clipboard to the scene's guides list. Pasted guides are inserted under the selected guide. Imports Drawing Guides from a source file and inserts them at the bottom of the scene's guides list. Duplicate guides are filtered out to avoid cluttering the list. Exports the selected Drawing Guide(s) to a destination file. Displays the scene's list of guides and allows you to select which guide to display and use.